My Father-in-law is pretty darn awesome. He’s an active senior who loves the freedom of driving. Not only that, he walks at least 3 miles a day, and can belt out the best rendition of Robert Goulet singing Happy Birthday. He also volunteers at the Senior Center, driving other seniors to their appointments. It’s no secret that people spend too much time in their cars. But for retirees, time behind the wheel can mean a nice little chuck of cash. And let’s not forget about the flexible schedule you can have. We all want that, right? To make money with your car, all you really need is a well-running car and a smart phone to run the app in order to select the gigs. Are you familiar with cell phone apps ? They’re little software programs (applications) that you download to perform a specific task. Each of the companies I have listed below want you to download their app so you can easily do the job and get paid. Don’t worry…they’re safe ! I should also mention that you may be able to take tax deductions for mileage, car detailing, minor repairs and other vehicle operating expenses. Driving jobs have their share of cons, too. Like wear and tear on your car and safety concerns. Oh…and the dreaded tax withholding on your earnings. I am not a tax accountant so I can’t tell you what to do here, but if I earned over $600.00 from any company – even the little side gigs – it would be considered earned income and I would have to pay taxes. Again, I’m not a tax accountant so please don’t take my tax info. as gospel. I’ve gathered up some of the better, well-known driving opportunities, sorted by category. Some of them require a bit more time, like the Grocery Delivery services, but they tend to pay a little more. I’ve known about the Amazon Flex delivery driver program for a while but never really saw it in action. Until a few months ago when a regular ‘ole car came up my driveway and the driver dropped off my Amazon package. Apparently, you can make $18.00 to $25.00 an hour delivering packages for Amazon, setting your own schedule 7 days a week. I live in a town about 60 miles west of Detroit. Amazon Flex has delivered to my home so even if you don’t live in one of these cities, go ahead and apply if you’re interested in this gig. You can learn more about Amazon Flex here. Roadie calls themselves “The On-The-Way Delivery Network”, which I think is kind of a cool concept. Using their app, you select which delivery jobs you want to do, based on your travel and your schedule. Do you happen to be going from Ann Arbor to Detroit ? Check the app to see if anyone needs something delivered “on your way”. The deliveries range in size and weight – you might deliver a recliner; you might deliver a trailer of stepping stones. You decide. As far as pay, the app will display the amount you will earn and you can expect local jobs to be between $8.00 and $50.00. Pay is by the delivery, not hour. And did I mention you get discounts, rewards, and special savings ? Yep, roadside assistance and free Waffle House yummies. Interested? This is where you can sign up with Roadie. Be sure to scroll to the bottom of that page to read their FAQs. Not really delivering packages, an Enterprise Driver delivers a fleet of box trucks, trucks and vans to and from rental locations. Drivers are actual employees of Enterprise, working part-time (20-25 hours a week), at the pay rate of $9.25 an hour. Applicants will be required to submit to and successfully complete a D.O.T. medical examination (paid for by Enterprise, 12-month minimum certificate). You can deliver food with Grubub by using your car, scooter, motorcycle or bike…whatever you have. The concept behind Grubhub is nothing new, there used to be a small company in my town that delivered restaurant orders throughout the city. Kind of like pizza delivery but with a variety of restaurants, diners, and eateries. Grubhub doesn’t share how much you’ll earn, but according to Glassdoor, the average pay is a little over $12.00 an hour. And you get to keep all of your tips. Another well-known food/restaurant deliver service is OrderUp. You can make money driving and delivering food after you apply online, schedule a call with OrderUp, pass a background check, and get your gear. You can make around $12.00 and hour and keep all the tips you get. OrderUp is not as big as Grubhub – they don’t have their food delivery service in nearly as many cities but they are adding more all the time. Be sure to check with them often (via the sign-up form) to see if your city is added. Launched by Uber in 2014 (Uber is listed in the Deliver People section below), UberEats is another popluar food delivery service that gives you a flexible schedule and quick pay. You can use your car, scooter, or bike as long as you have a valid license, insurance, ID and are of the right age for your preferred method of delivery. According to the salary websites I’ve checked, you’ll make around $11.00 an hour. You might make even more depending on where you live and how many deliveries you make. An on-demand restaurant deliver service, Door Dash is similar to the others I listed above. You sign up, give them the appropriate information, load their app to you phone, start delivering food orders to customers. Easy as that. Except you’re called a Dasher. The cities that Door Dash Drivers can deliver in can be found on this page. According to DoorDash, you are paid by the delivery and you get to keep 100% of your tips. Ok, so how much is the per-delivery rate? You’re guaranteed to make $1.00 plus what they call a “pay boost”. The pay boost takes certain things into consideration, such as distance, wait time, parking issues, order size, and location. An article by StudentLoanHero tells us that Dashers in Brooklyn, NY make, on average, $15.00 an hour while Dashers in Washington DC make $18.00 to $20.00 an hour. And this thread in Quora shows current Dashers in other areas claim the pay is more like $12.00 to $18.00 an hour. If you want to learn more about their pay schedule, you can check out this article, and this one. I want to back up a bit here. $25.00 an hour sounds great ! And who doesn’t spend at least an hour grocery shopping ? But the reality is you are paid $5.00 an hour and then 7.5% of the entire order. So, depending on the size of the order, you can make barely over $5.00 an hour or up to $25.00 an order with the average shopper making over $20.00 an hour. Oh…you get to keep any and all tips you are given. And I want to clarify this: Shipts Q&A profile on Indeed.com tells us that you DO NOT pay, then get reimbursed, for someone else’s grocery order. You use a pre-paid Visa provided by Shipt. If you can deliver groceries to your customers within 2 hours, you’re awesome ! At least that’s what Instacart expects of you. Actually, there are two ways to make money grocery shopping with Instacart: shopping and delivering or just shopping. 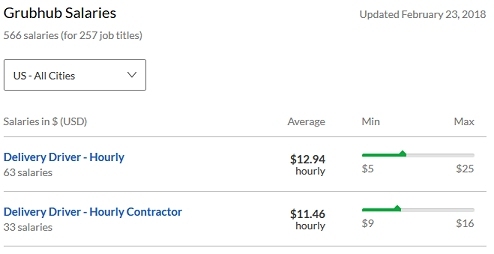 Either way, Shoppers on Indeed.com say they earn anywhere from just under $10.00 an hour to around $25.00 an hour, with the average being over $24.00 an hour. Of course, the more shopping you do, the more you make. And just like Shipt, you pay for your client’s groceries via a pre-paid card. Move over taxi, Uber is in town. As an Uber driver, you pick up a fare (rider), take them to their destination, and collect your payment. So how much do you make ? It depends. I have read that the average Uber driver makes $364.00 a month. But – according to Uber – your earnings depends on the number of rides you take, the time of day, your location as well as “other factors”. Money never exchanges hands – all fares are paid via the Uber app – and any tips given are also added to the app. To get started, you sign up, upload your license, vehicle registration and proof of insurance, then download the app once you’re approved. Besides the obvious requirements…being over 21 and having a valid license…you need to have a 4-door car and pass a screening test. Lyft is similar to Uber; customers use their app to request and pay for rides. As a driver for Lyft, you pick and choose the fares you want to pick up and you are paid per minute and miles driven. Being tight-lipped with how much they pay drivers, Lyft has a handy calculator where you can plug in fictitious time and city data to see how much you can make in any location Lyft operates. A ride service for kids, Hopskipdrive claims “you can make up to $30.00 an hour “working with kids, setting your own schedule, and enjoying the ride.” This is a great paid driving opportunity for drivers over the age of 23 who also have at least 5 years of childcare experience. You set your own schedule, get bonuses, and they provide comprehensive insurance coverage for you. Have you ever seen those cars with logos and company graphics all over them? I always thought they were company cars driven by a Sales Rep. of that particular company. Turns out, most of them are regular people who agreed to have their car wrapped (not painted) in graphics as a way to advertise the company. And those people are getting paid a pretty penny to drive around with those graphics. A few hundred dollars a month pretty. If you’re OK with having colorful graphic wraps all over your car, check out Wrapify and Carvertise. Are You Ready To Get Driving? 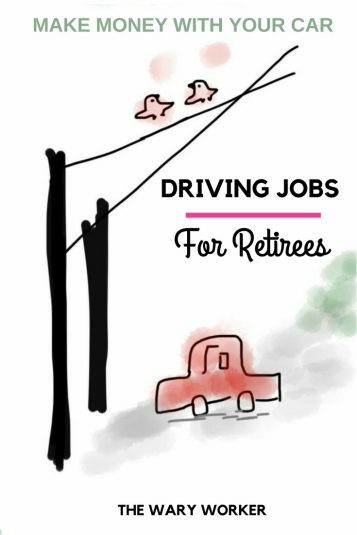 When it comes to driving jobs for retirees, there are quite a few options for you. Spend your time doing a variety of driving services and making a bit of money while you’re at it. What do you think ? Any of these sound interesting to you? Please leave a message and let me know.